My time as a comiXology customer has been pretty interesting, particularly given how I've been able to legitimately discover new titles of interest for me to get into. I know it sounds like a horrible marketing blurb, but I have to admit it's true. In my case, there's nothing like a sale to convince you to invest in a comic book series in a serious way. I had long been considering getting into Locke & Key but I kept delaying things for one reason or another. I had tried out the odd free issue released online and the whole premise did rather intrigue me, although I'll admit that things with a bit more of a horror vibe have never been my strong suit. But comiXology released a crazy deal for the entire series to coincide with the ending of this tremendous story, and so I figured it was a sign to finally get into the story. More than the sale price, the deal offered a complete story experience with a beginning, horrific middle, and end. And that really makes it easier to consider trying out any comic book series. Synopsis: Locke & Key is a comic book series written by Joe Hill and illustrated by Grabriel Rodriguez as published by IDW Publishing. The series has received a number of nominations and awards for both its writing and its achievements as a comic as a whole. The entire series is divided into three acts, with each act consisting of two 6-issue mini-series each. The story arcs include "Welcome to Lovecraft", "Head Games", "Crown of Shadows", "Keys to the Kingdom", "Clockworks", "Alpha & Omega" and bonus content in "The Golden Age". The basic premise is simple enough - we first meet the three Lock children, Tyler, Kinsey, and Bode, move into an old house known as the Keyhouse together with their mother, Nina. The family is getting past the trauma of their father's murder, but the move to the new town and the new home also leads to a number of revelations of a different kind. As we learn more about the Lockes and their history, we also discover the secrets of the Keyhouse and the mysterious Keys with their unique powers. The keys grant the bearers a wide range of abilities ranging from strength or flight, but also going all the way as creating creatures out of shadows and the ability to literally open someone's head and see physical representations as their thoughts. But of course the bigger question remains to be - what are the keys for? Where did they come from? And given all the keys being hidden around the Keyhouse, what ties them all together? And that's the real mystery that drives the story forward and keeps you as a reader hooked. At first things are happy enough with the kids discovering the various keys and celebrate the powers that each one grants them. And so you start with a lot of different little joyous moments as each power is explored and pretty much celebrated. But then we learn one important fact - that somehow these keys have been crafted from the essences of demons. And that just turns everything on its head - even though for the most part this is something we know as readers but not all the characters have the same knowledge. The art style took a little getting used to - the backgrounds and scenery were awesome, no doubt. But I didn't quite get on board with how the people were drawn, which oddly reminded me of the stylings of the comic strip Doonesbury for some reason. But beyond that, the story is just so overwhelmingly strong that everything else just pales in comparison. The story is all that matters and it's a brilliant, compelling tale that I'm glad that I got to read in quick succession as opposed to have waited for its release schedule. The waiting would have killed me! 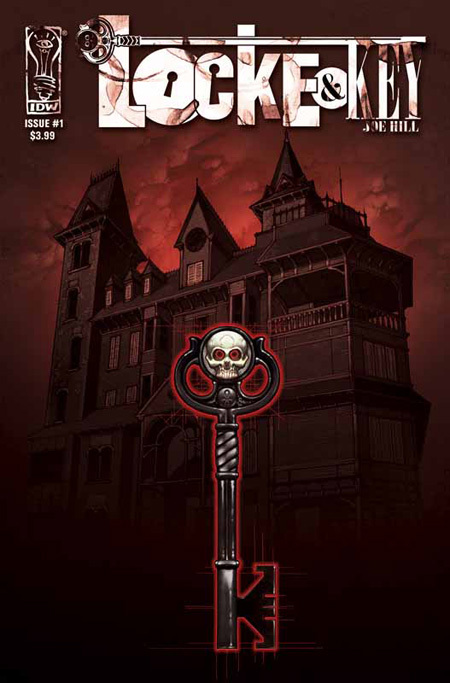 Locke & Key is a brilliant comic series and one that everyone could benefit from reading. And thus the reason why there are efforts to turn the comic into a TV series and a movie. And it's already a card game! So I think it's more than fair to give the series as a whole is worth 5 treacherous magical keys out of a possible 5.